In the "Annual Regional Analysis," a report created by Kids First Chicago and the Chicago Public Schools that claims to provide "a universal fact-base of Chicago public schools," school ratings are presented devoid of context. There is no analysis of how poverty and racial segregation have affected students. In addition, there is no breakdown of CPS spending in the schools. “We cannot improve schools if we don’t all have the same facts on school performance and access driving our collective efforts,” said Daniel Anello, CEO Of Kids First Chicago, in a Sept. 14, 2018, press release. Kids First Chicago CEO Daniel Anello and Chicago Public Schools CEO Janice Jackson travelled together to Denver in January 2017, according to Chalkbeat, where they heard about a parent-friendly comprehensive report, which led to CPS' Annual Regional Analysis that promotes school choice. 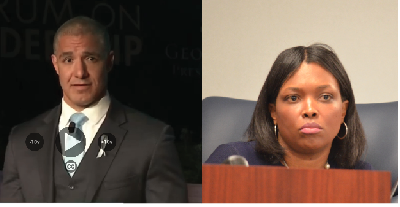 Anello screenshot from April 2018 speech at George W. Bush Presidential Leadership Forum. Jackson photo, at the June 2018 Chicago board of education meeting, by Sharon Schmidt. But Kids First Chicago (sometimes using the corporate-style moniker of "K1C"), which began as the Renaissance School Fund, then New Schools Chicago before its latest rebranding, and created by Civic Committee of the Commercial Club of Chicago in 2004, wasn't made to improve schools. Its goal is to privatize public education. School choice is a union-busting, money-making opportunity, a pile of public money just waiting for taking. Noble, which operates 18 charter high schools in Chicago, reported $165 million in revenue, and its founder Michael Milkie was paid $262,138 in salary and benefits, including a $20,000 bonus for the school year ending June 30, 2017, tax filings show, the Chicago Sun-Times reports as part of its story on Milkie's resignation for inappropriate behavior. Kids First Chicago writes of its involvement in the press release: "Over the last 10 months, K1C helped the district design the Annual Regional Analysis (ARA), a new report comprised of publicly available data in a more connected and easily digestible format that includes maps, graphs and key performance metrics. This easy-to-access collection of data is meant to serve as a universal fact-base so that community leaders, policymakers, parents, and educators will have access to the same information CPS utilizes and be better equipped in their own efforts to support Chicago families." Appearing on page 11 of the 28-page overview of the report, the map of median household income is shrunk to one-eighth of the page. Data featured prominently in the report by region are school choice patterns, school ratings, enrollment data and race of students, but not income. 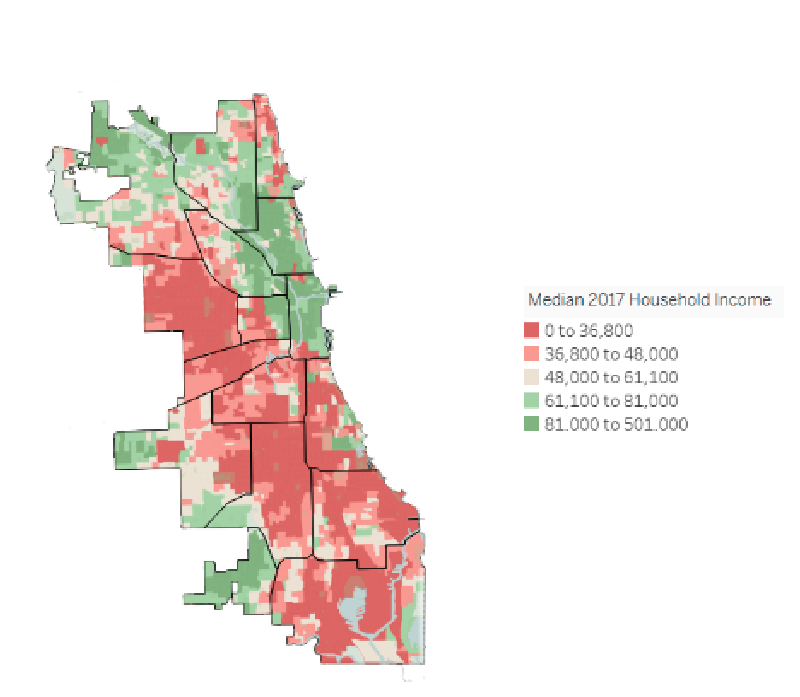 In the overview of the report, the word "income" is mentioned once; "choice" appears 32 times.The "universal fact-base" does not include the most important realities of Chicago students and schools – poverty and CPS spending on buildings and programs in predominantly white neighborhoods. [T]he data provided does not constitute a comprehensive foundation for allocating resources or making high-stakes decisions about schools. There are simply too many faulty assumptions and too many questions left unanswered. Our groups have studied the research on indicators of school quality, and we know that CPS uses a rating system that is far too narrow. For example, 80% of the rating for elementary schools is based on standardized test scores and attendance. Research has shown that test scores and attendance tell us more about the socioeconomic status of the students’ communities rather than the teaching and learning inside the school itself. When parents send their kids out the door in the morning or look for a kindergarten program for their kids, they are concerned with things well beyond whether everyone in the building is a good test taker. Is the school welcoming? Are the principals strong leaders? Is there strong professional development? What are the wraparound supports? What is the climate of the school? Despite the absence of many of these factors in the CPS ratings, schools continue to be stamped with a Level 1, 2, or 3, and then community perception is then guided by these narrow labels. 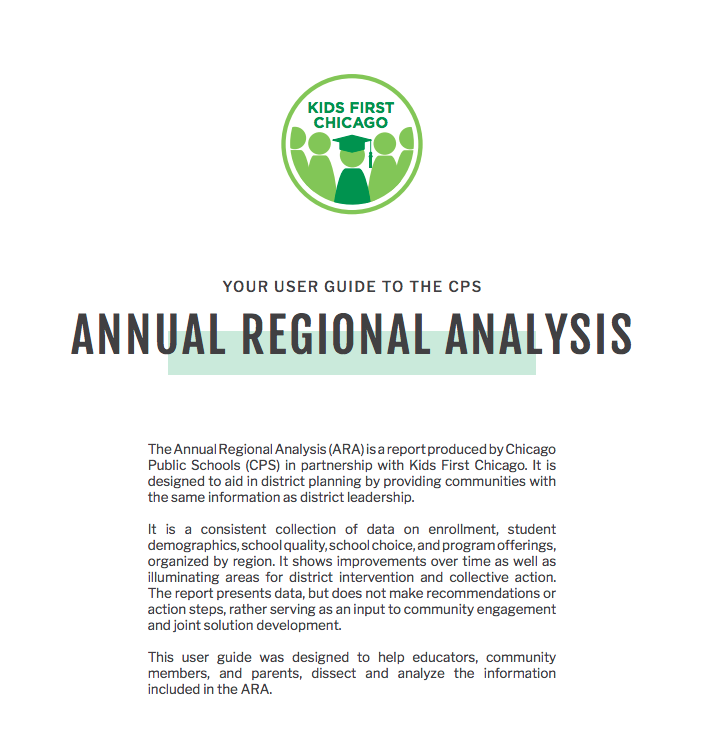 Kids First Chicago talks of its partnership with CPS on its website introduction to the Annual Regional Analysis. CPS doesn't mention Kids First Chicago on its website or in the Annual Regional Analysis. No authors are listed.It is no surprise that the ARA assumes school choice as the driving principle behind any school improvement, despite the fact that it is not an evidence-based feature of school improvement. The report was written by Kids First Chicago, formerly known as New Schools for Chicago, and before that we knew them as the Renaissance Schools Fund. This organization has played a key role in privatizing the CPS system through the diversion of public dollars to privately-run charters. It is no wonder, then, that choice made it into the report as a key dimension of improvement. Yet, neither Kids First Chicago, nor CPS, provided an evidence-based rationale for the ad hoc proliferation of charters during declining enrollment and budget deficits. This organization drove the school closings narrative, a strategy that according to a recent report from the UChicago Consortium on School Research has harmed, not helped, low-income students of color. cultures and feel like a cohesive community.